Northern gardeners on the lookout for highly unusual perennials will want very much to track down this marvelous lysimachia. It has been causing quite a stir in my ‘hood since I introduced it to the garden last year. 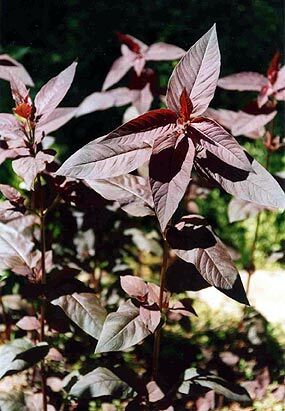 3’ tall stems support fairly widely spaced branches from which generate the most bewitching, chocolate-red foliage you’ve ever seen. 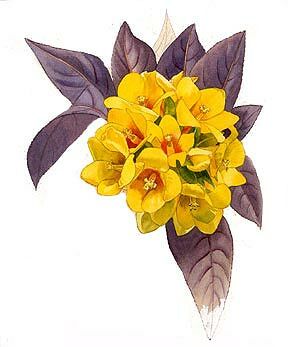 Flowers are stellar as well, clusters of rich yellow bells that combine with the foliage to make the plant an unequalled standout in the garden. The denser the shade, the darker the foliage; move the plant around to find an area of lightest shade, so you get the red thing going. ‘Purpurea’ performs best in part shade; morning sun and afternoon shade and vice-versa, or dappled shade throughout the day, is ideal. Too much hot, midday sun and the plant will burn. This is a loosestrife, remember, so you need to prepare a good, well-drained soil rich in organic matter, then don’t allow it to completely dry out. Plant it with other moisture lovers such as astilbe, aconitum, and rodgersia, and other perennials you find yourself watering twice a week. The plant will perform well in bog gardens. Though ‘Purpurea’ is not as invasive as other varieties, it will gallop out several feet each year. I purchased the plant last season at Ambergate Gardens in Victoria, Minn., and was lucky to be shopping that day accompanied by Iowa garden writer and former Better Homes and Gardens editor Craig Black; I toddled toward the sales desk clutching three pots. Luckily, Craig intercepted me en route and whispered, “Buy only one.” This spring that one pot of three stems came up as seven lush new plants, filling an area around four square feet. Divide in spring or early fall. Hardy to Zone 3. Comrades living outside the Twin Cities can purchase the plant bare-root by visiting ambergategardens.com, and requesting their bare-root catalogue.